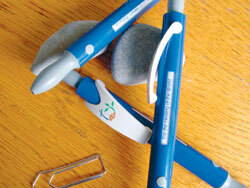 Everyone distributes ballpoint pens – small companies, global players and also church organizations. So it comes as no surprise that they are left lying around everywhere and also break easily. Dean Jürgen Astfalk of the Evangelical Lutheran Church in Italy (ELKI) can tell a quite different story. Every year the Italian church has ballpoint pens made especially for its synod members. They are unique in that they have two windows displaying six short messages. The ballpoint pen has become very popular with ELKI synod members, Astfalk has observed, and so very few tend to be thrown away or lost. Enthusiastic about this idea, the LWF Area Secretary for Europe, Rev. Dr Andreas Wöhle took back a proposal to Geneva that a special pen be developed for the Tenth Assembly. The Italian church has had 3,000 such pens made for the global LWF gathering in Winnipeg this summer, with the aim to give each church delegate a pen. A white window in the pen’s deep blue surface has six display options—the Assembly theme, "For the Healing of the World" in four languages, English, French, German and Spanish; the event and venue; and date. The Assembly logo is imprinted on a broad, white clasp just below the base, which like the narrower writing point is gray in color. Astfalk hopes that this support from Italy will contribute to communicating the positive aspects of the Assembly in Winnipeg at congregational level, and that the delegates will regard it as a pleasant memento of Winnipeg. The ELKI has around 7,000 members, and joined the LWF in 1949.